The National Museum of History and Art (Luxembourgish: Nationalmusée fir Geschicht a Konscht, French: Musée national d'histoire et d'art, German: Nationalmuseum für Geschichte und Kunst), abbreviated to MNHA, is a museum located in Luxembourg City, in southern Luxembourg. It is dedicated to displaying artworks and artefacts from all epochs of Luxembourg history. The museum is situated in Fishmarket, the historic heart of the city, in the Ville Haute quarter. The first proposal for such a museum was made during the French occupation of the Revolutionary Wars, when Luxembourg was annexed into the département of Forêts. However, the museum was never opened, despite the expropriation of a number of artefacts from the church. With the affirmation of Luxembourg's independence under the 1839 Treaty of London came a greater interest by native Luxembourgers in promoting the history of their country. In 1845, historians and archaeologists formed the 'Society for the Study and Preservation of Historic Monuments in the Grand Duchy of Luxembourg' (French: Société pour la recherche et la conservation des monuments historiques dans le Grand-Duché de Luxembourg), regularly known as the 'Archaeological Society' (French: Société archéologique). The society took over the responsibility of maintaining a collection of historic antiquities from Luxembourg City's Athenaeum. In 1868, the Society received a boost from the establishment of the Royal-Grand Ducal Institute (French: Institut royal grand-ducal), amongst the responsibilities of which was the conservation of archaeological collections. The museum has been expanded with a new building designed by Christian Bauer et Associés, opened in 2002. ^ a b c "Historique" (in French). Musée national d'histoire et d'art. Archived from the original on 2007-02-19. Retrieved 2007-01-02. ^ To become just the 'Grand Ducal Institute' (French: Institut Grand-Ducal) in 1890, when the personal union of Luxembourg and the Netherlands ended. Jonas Ferdinand Gabriel Lippmann was a Franco-Luxembourgish physicist and inventor, and Nobel laureate in physics for his method of reproducing colours photographically based on the phenomenon of interference. Charles Lenormant was a French archaeologist. The National Museum of Natural History is a natural history museum in Luxembourg City, in southern Luxembourg. The museum is located in the Grund quarter on the eastern bank of the Alzette river, next to the Neumünster Abbey cultural centre. 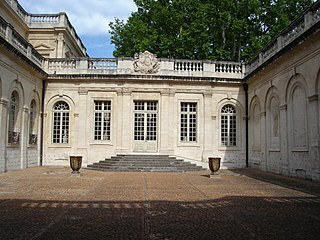 La Fondation Calvet is an art foundation in Avignon, France, named for Esprit Calvet, who left his collections and library to it in 1810. The foundation maintains several museums and two libraries, with support from the town. The original legacies of paintings, archaeological items, coins and medals, and medieval sculpture have been added to by many other legacies, and a significant deposit of works of art from the Louvre. The archaeological collections and medieval sculpture are now housed separately in the "Musée Lapidaire" - once the chapel of the Jesuit College. The main museum is in an 18th-century city mansion, to which modern buildings have been added; the Library bequeathed by Calvet, and the important collection of over 12,000 coins and medals, have moved to a different location in the city. Celtic Luxembourg existed during the period from roughly 600 BC until 100 AD, when the Celts inhabited what is now the territory of the Grand Duchy of Luxembourg. Their culture was well developed, especially from the 1st century BC, as can be seen from the remains of the extensive Titelberg site in the far southwest of the country and from the impressive finds in several tombs and necropolises in the Moselle valley and its surroundings. Lucien Wercollier was a sculptor from Luxembourg. The Musée Gadagne is a museum located in the center of the Vieux Lyon, in the Saint-Jean quarter, in the 5th arrondissement of Lyon. It is composed of the Musée d'histoire de Lyon and the Musée des marionnettes du monde. The building was classified as monument historique in 1920. It was successively acquired by the city of Lyon between 1902 and 1941. After the finding of its obsolescence, the museum closed in 1998 for more than ten years of renovation and expansion. It was re-opened on 12 June 2009. The Ducal Palace of Nancy is a former princely residence in Nancy, France, which was home to the Dukes of Lorraine. It houses the Musée Lorrain, one of Nancy's principal museums, dedicated to the art, history and popular traditions of Lorraine until the early 20th century. It has been listed since 1840 as a monument historique by the French Ministry of Culture. The Musée d’Art et d’Histoire is the largest art museum in Geneva, Switzerland. Yves Morvan is a French archaeologist, specialist of the romanesque art and of the iconography of Blaise Pascal. He is also a restorer, sculptor of religious characters, as well as member of the Academy of Science, Literature and Arts of Clermont-Ferrand. Léonce Bénédite was a French art historian and curator. He was a co-founder of the Société des Peintres Orientalistes Français and was instrumental in establishing Orientalist art as a legitimate genre. The Château-Gaillard is a French hôtel particulier and an archaeological museum, built in the late Middle Ages in Vannes. The Musée d'Angoulême, formerly the Musée des beaux-arts d'Angoulême, is a public museum in Angoulême, France. It is located beside the Angoulême Cathedral in the heart of the historical center of the city, It is classified as a Musée de France, and has important archaeological, ethnographic and artistic collections. It also hosts temporary exhibitions and conferences. Louis Charles André Alexandre Du Mège or Dumège,, was a French scholar, archaeologist and historian.